It all starts the minute they walk onto your lot. Their guard is up. They think they know that car salespeople are tricky. In their mind, they’re slicker than snake oil salesmen, and they’re out to make a quick buck. So what do you do? How do you overcome this negative stereotype? Do you make them wade their way through a hungry group of curb qualifiers out on the lot? Do you kick off the conversation by asking what color car they want? It’s true that most of today’s car buyers have done some—okay, a lot—of research. So if you waltz out onto the lot and act like they’re worst nightmare, a “typical” car dealer, then they’ll respond in kind. And before you know it, the interaction will deteriorate into a battle over price and features. 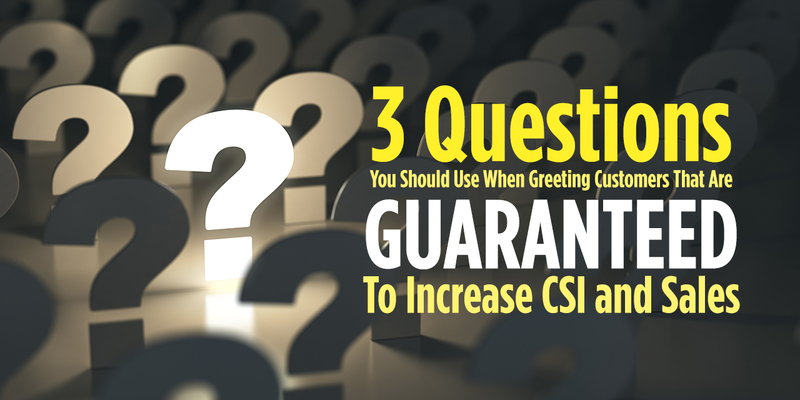 These questions will focus on your customers’ needs and start to create a human-to-human connection between them and your salespeople. Creating a human-to-human connection will make your customers feel heard and understood. And, when your customers feel heard and understood, you’ll be able to provide real value by helping them find the solution they really need. A positive side effect? You will also transform their feelings both about salespeople and the car-buying process.